"Chapter One: He was as tough and romantic as the city he loved. Beneath his black-rimmed glasses was the coiled sexual power of a jungle cat. [I love this.] New York was his town, and it always would be...."
While in his previous film the relationship was the star, here, it is the title character, the romanticized, idealized borough of Allen's vision. And while Hollywood tends to focus these days on the gritty urban crevices, Woody paints HIS town in broad, luminous strokes, making it more alluring and attractive than we have seen it since On the Town. Add to this the all-Gershwin score, and we are as hopelessly enamored as he is. But even a city like New York is only a sum of its parts, in this case the entangled lives of a handful of its denizens. Again, Allen invites the viewer in, a fly on the wall, to witness the more intimate moments of very personal relationships. The choice of black & white is sublime here—the absence of color narrows our focus and accentuates the natural, rambling dialogue that is key to Allen's films. And in the expert hands of cinematographer Gordon Willis, there is more revealed in the subtle contrasts than color could provide. We have Isaac Davis (Allen), a 42-year-old man who, by his own admission, doesn't know what it means to say "I love you." He's had a difficult history with relationships ("I've never had a relationship that lasted longer than Hitler and Eva Braun...."), including a wife (Streep) that left him for another woman. When we meet him, he is dating Tracy (Hemmingway), a high school senior who KNOWS she is in love with him no matter how he tries to tell her it isn't so. His best friend Yale (Murphy) has had a long and, in Isaac's mind, ideal marriage, but reveals that he has been seeing another woman—the abrasive, erudite Mary Wilke (Keaton). When Yale decides to break it off, he encourages Isaac to see Mary and they hit it off. Isaac breaks it off with a tearful Tracy, then Mary breaks it off with him.... So goes the story, so goes life. Allen is at his best as he weaves then unravels then attempts to mend these fragmented experiences into a recognizable whole with heart, humor and yes, humility. Didn't know he had it in him? Watch his acting in the last 10 minutes of the film; watch his face in the last 7 minutes; watch his eyes in the final 20 seconds. Here is a man who has learned something, whether he likes it or not. 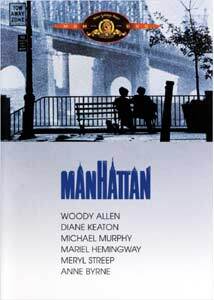 Manhattan is a love song, pure nostalgia, the sentimental side of Woody Allen. Only 2 years after his Oscar® triumph, his vision has matured tremendously, his humor is more carefully crafted and his neurosis is a bit more in check. He has come to terms with his emotions and lays them out for us instead of hiding behind jokes and gags and follies. The flawless Annie Hall seems like burlesque compared to the sophisticated humor revealed here. "...about, um, people in Manhattan who, uh, who are constantly creating these real unnecessary, neurotic problems for themselves 'cause it keeps them from dealing with more unsolvable, terrifying problems about, uh, the universe...."
Image Transfer Review: Allen himself claims to be disappointed with the print that went out to the theaters, saying it was too dark. I imagine, then, that this transfer is from that source, as it is a bit dark overall. Still, the contrast was purposefully soft to lend an ambience of nostalgia to the feel of the film, a sense of Manhattan in its age of elegance. The image is remarkably clean, with a few nicks and no major aberrations. Audio Transfer Review: The soundtrack is DD mono on both the English and Spanish tracks. The dialogue is distinct and balanced, and within the body of the movie the Gershwin score is proud but tamed. My main complaint is that in the opening sequence which features the transcendental "Rhapsody in Blue", the volume is enhanced so that it must be turned up when the dialogue begins. Not so following the denouement. Extras Review: The collectable "booklet" is more than a bit disappointing, amounting to one page of interesting information that leaves much to be desired. A few quotes, a handful of stills and its over. The trailers are presented in widescreen in their original state. Knowing Allen to be a private man, expectations did not run high and yet, considering the importance of this transitional film, I longed for something to enhance the experience. In a stunning, complex performance by Hemmingway as the innocent savant, Tracy is the one who understands the simplicity of love and sets the tone, if only the "adults" would listen.... This film remains the axis on which Allen's rebirth as a filmmaker continues to turn. Funny, charming and still as relevant today, a must have for Allen devotees, and a must see for anyone who has agonized over what it means to say "I love you." Very, uh, you know, recommended.